Welcome to Turbulence Training Day 4. Home fitness workouts that'll burn fat and sculpt your body in 4 weeks. This is day 4 of Turbulence Training's Buff Dudes and Hot Chicks fat burning workout. "Awright there? This is Asad again from Better4Fitness.com. 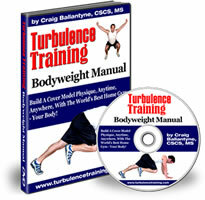 And today's day 4 of my test-out of Craig Ballantyne's Turbulence Training workouts. ...The workout yesterday was pretty good, it was upper body stuff. Got me feeling really good afterwards actually. And today I'm not too sore, which is a good thing. So I'm gonna do some stretches, some light stretching, ready for tomorrow's workout which is gonna be quite tough. I've had a look at it and it looks pretty tough to me! So considering it's the first week, I want my body completely safe, so I'll be doing some stretches and I won't push myself too hard tomorrow, but we'll see how it goes. That's it for day 4, and I'll see you tomorrow, take care."